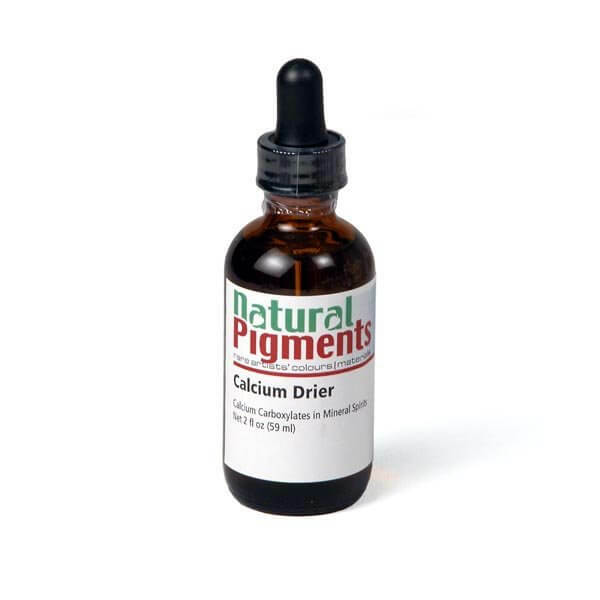 Calcium drier functions as a pigment wetting agent to improve dispersion of pigments in oil and alkyd vehicles thereby improving gloss and hardness of paint. When ground with pigments it minimizes loss of drying capability of other driers. It improves the action of cobalt driers and is used in conjunction with them, and assists in the "through dry" of oil and alkyd paint. Typically, 0.02% to 0.3% of calcium metal is added to oil and alkyd paint based on the weight of the binder. Even higher levels may be required when using as a wetting agent or loss of dry inhibitor. Add one drop per 5 ml (about 1 teaspoon) of paint. Suggested use levels should be verified with tests. WARNING! CONTAINS: PETROLEUM DISTILLATES. Exposure may cause skin and eye irritation. Overexposure will cause dizziness, drowsiness, headache, nausea and cracking or drying of skin. Avoid contact with skin. Avoid breathing mist or vapor. Wear safety glasses, protective clothing and chemical resistant rubber gloves when handling. Wash thoroughly after handling. Do not take internally. Eye Contact: Flush eyes at once with large amounts of water for at least 15 minutes, while holding lids open. Get medical attention. Skin Contact: Wash thoroughly with soap and water. Wash clothes and shoes before reuse. If irritation persists, get medical attention.